During the firs days of October 2002, a boy called Julio Henriquez along with his family were on vacations in the Southern city of Concepcion Chile. 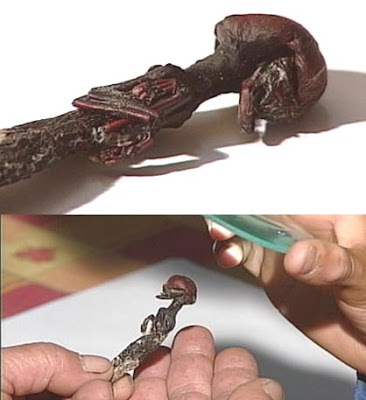 The family Henriquez Carreno suddenly found around some bushes a small creature like a humanoid. 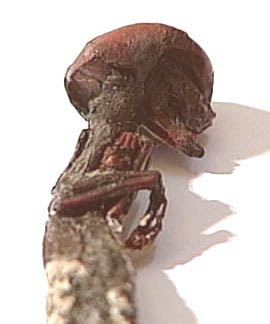 The small being was only 7.2 cm [2.8”] long. The boy affirmed that the creature stayed alive for eight days and that he even opened his eyes at times. It was amazing when the creature apparently died he kept being hot, and he continued hot for a long time. Ruanel: That creature was an extraterrestrial. Interlocutor: How did he come to Earth? Ruanel: In a space ship, but he didn't come alone, but with other partners. Interlocutor: And what happened to him? Ruanel: He had a problem with a terrestrial virus, he was not able to adapt to this planet. Interlocutor: Why didn't they take him? I ask it because when the boy found him he was still alive. Ruanel: They simply didn't want to endanger the health of the ship. Interlocutor: So they decided to leave him here abandoned? Interlocutor: Was he agonizing when they abandoned him? Ruanel: No, he was not that sick yet. Interlocutor: Did they leave him with his passive consent? Ruanel: No, obviously not, he wanted that they took him to an isolated chamber so that they study his problem somehow and try to solve it. Interlocutor: Was it something cruel on their behalf? Ruanel: It was indifference directly. Ruanel: These extraterrestiral beings have that idiosyncrasy, they don’t care about what happens to the others. Interlocutor: What old was he? Ruanel: Around 38 terrestrial years. Interlocutor: How many years do these beings live in their planet aproximately? Ruanel: 112 years more or less. Interlocutor: What planet did they come from? Ruanel: From a planet which is quite far from us, around 6000 light years. Notice that the closer stars are at dozens of light years. Interlocutor: What was the size of their ship? I ask it because these beings were very small and they should have a ship according to their size. Are All the inhabitants that small? Ruanel: Obviously yes. as to the size of the ship, it measured 180 mts. [590 ft] approximately. Interlocutor: Keeping in mind the small size of their structure, I consider that it was a quite big ship. Interlocutor: What is the name of their planet? Ruanel: Horix, and these beings would be Horixians. Interlocutor: I understand. Horix 3 or 4? Interlocutor: Obviously the whole atmosphere of Horix is proportional to these beings, trees, animals, etc. Interlocutor: Okay, Is there anything more to add about this? Ruanel: No, not about this case. This entry was posted at Tuesday, October 06, 2009 and is filed under Extraterrestrials . You can follow any responses to this entry through the .